Are you and your partner fighting more lately? Are you both too busy to get a good night sleep? Is one of you getting poor sleep on the couch to not disturb the other? Many people struggle with sleep problems and it has been empirically proven that lack of sleep has a greater impact on our lives and relationships than we imagine. Every couple experiences some sort of relationship conflict, and a better night’s sleep has been shown to help. Before you assume your relationship is in trouble, take a look at how you are not only managing the disagreements, but also your sleeping habits. The National Sleep Foundation concludes that the average adult requires seven to nine hours of sleep per night in order to obtain optimal mind and body functioning. However, most people report sleeping less than seven hours per night leaving them feeling tired all the time, irritable, and wanting more sleep. Below are three ways lack of sleep negatively affects your romantic relationships. 1. Less sleep makes you irritable, leading to more conflict. A large body of research proposes that relationships experience worse romantic conflicts when just one member of the couple is sleep-deprived. Sleep-deprived people are more hostile and used more negative words in their social interactions than those who get appropriate sleep. Consequently, research found that men were more likely to fight with a spouse after a night of disturbed sleep, putting unnecessary strain on the relationship. 2. Sleep deprivation negatively effects decision-making. Sleep has been shown to play a large role in our decision-making process. Sleep deprivation makes you easily distracted, reckless, and more willing to take dangerous risks. Therefore, getting less sleep can lead to making poor decisions regarding your romantic relationships. 3. Less sleep effects relationship happiness. Evidence shows that lack of sleep affects how many positive feelings you have toward your significant other, how secure you feel in the relationship, and how close you feel to your partner. Research proposes that those with fewer sleep problems tend to express more happiness in their lives and relationships. From this research, one can conclude that unhealthy sleep patterns put significant pressure on the health of your relationship. If research does not persuade you that getting more sleep at night improves your relationship, consider trying it yourself. Take two or three weeks and make sure you get a full eight hours of sleep while adding some alone time with your partner each night. You will find that both of you are more relaxed with each other, feel closer, and sleep better leaving you in better moods and more patient with one another during a conflict. 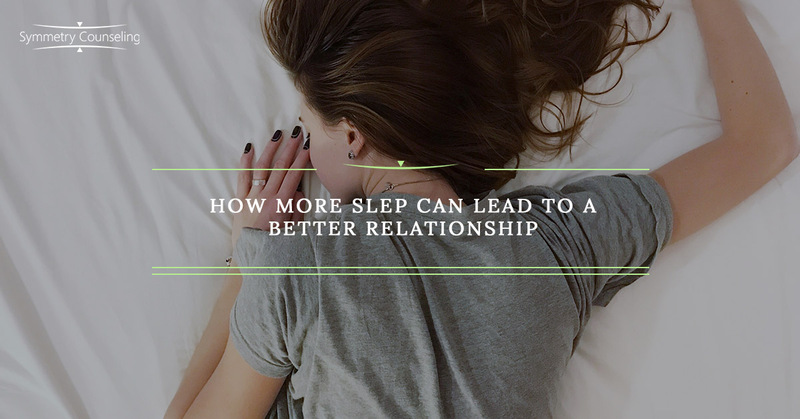 If you are currently experiencing conflict in your relationship and would like to know more about how better sleep can help, it may be useful to connect with a therapist. Contact Symmetry Counseling to set up an appointment with one of our highly skilled therapists at one of our two Chicago locations.